Our Affiliate Program is designed to provide an incentive for health-, nutrition-, or self-improvement-focused venues to regularly promote GSG products and services. The program will compensate health professionals, educators, and individuals who demonstrate a regular effort to promote GSG products and services. Affiliates are paid a referral commission based on a percentage of eligible sales. 3) a health practice or program that actively promotes GSG products or services. Ineligible venues include non-health-related websites, coupon listing websites, and affiliate link repositories. Please contact affiliate support to see if any alternative approaches to promoting GSG products and services qualify. A referral is generated when an order or opt-in is made by a lead who is sent to our site by an affiliate. Example A: 1.) Joe clicks on your affiliate link, 2.) Joe purchases an eligible item, 3.) you are credited with a referral and earn a commission. Example B: 1.) Pat clicks on your affiliate link, 2.) Pat opts in to a free offer, 3.) you are credited with a referral. Example C: 1.) Jen clicks on your affiliate link, 2.) Jen does not purchase an eligible item, 3.) you are not credited with a referral. Once a lead generates a referral, the affiliate receives the future commissions from that customer as long as the affiliate remains eligible and active. We do not give credit for referrals on orders that have already been completed, or that were not processed through an affiliate link. Referral commissions are derived from the net price of eligible order items. Not all products or services may be eligible. Product eligibility and rates may change any time without notice. * Exceptions apply. Rates and eligible items may change depending on active promotion. Rates and terms may change without notice. ** If coupons or bonus items are eligible, the respective value is subtracted from the item price before the commission is calculated. Commission payments are made to the email address associated with the Affiliate account via PayPal. Unclaimed, denied, undeliverable, or returned payments are considered forfeited and are not re-sent. Affiliates are responsible for keeping their Affiliate account email address current. Payments are made according to the payment schedule in the Affiliate Center. Affiliates are responsible for keeping their PayPal account properly linked to their GSG Affiliate account email address. If changes are made to the email address used in either account, Affiliates must ensure the other is properly linked. Without a properly linked PayPal account, Affiliates can not receive commission payments. PayPal email account. Clawbacks are retractions of commission payments due to refunds issued on orders which had generated referral commissions. If a refund is issued for an order which generated a commission for an affiliate, the commission will be retracted in one of two methods described below. If a miscalculation has resulted in a commission payment to our detriment, the commission may be retracted in one of two methods described below. The retracted commission amount will be deducted from the Affiliate's current or future commission payment. The retracted commission amount will be requested from the Affiliate's PayPal account. PayPal does not charge a fee if payment is made from your PayPal balance or bank account. See PayPal for details. Although we take measures to minimize clawbacks by postponing commission payouts until the typical refund period has passed, it is possible that clawbacks will occur. Orders placed by leads failing to use an affiliate link are not eligible for referral consideration. Requests for retroactive referrals will not be accepted for existing orders without advance approval. If you have referred a lead to our site and the lead fails to use your affiliate link for any reason, a referral will not be credited to your account retroactively. If a lead referred to our site finds the use of your affiliate link to be problematic, contact us immediately. Leads whose devices block HTTP cookies, thereby preventing referrals from being completed, are not eligible for referral consideration without the prior approval described herein. The GSG Affiliate Program requires cookies to assign leads to affiliates. Certain venues will receive permission in advance for leads to place orders by manually entering an affiliate link URL. For example, an alternative health practice who directly promotes GSG products on location, but does not have a website or online venue to promote GSG products, may receive approval for retroactive referrals. Since GSG Affiliates are required to actively promote GSG products and services, it is expected that referrals be generated by use of affiliate link. Review the Scope and Eligibility section for approved venues. Potential Affiliates who operate in a venue not included in the Scope and Eligibility section may contact affiliate support to request approval for an alternative venue. Copying and/or distributing content from greensmoothiegirl.com without express permission is not allowed. Copying and/or distributing content from books, eBooks, newsletters, or emails is not allowed. Publishing affiliate links repetitiously, in a misleading way, or without adequate promotional content is considered misuse. Misrepresenting GreenSmoothieGirl.com or implying or posing as a subsidiary or representative of GreenSmoothieGirl is not allowed. Online systems that compete with or divert website traffic from the GreenSmoothieGirl.com website are not allowed. Membership content and materials, such as our Detox and 12 Steps programs, may not be shared outside their respective membership area. Affiliates wishing to promote memberships should use swipe content or create promotional material congruent with the respective public membership page, public product pages, or personal experience. Care should be taken to not reveal the unique aspects or methods of our programs that would normally be available to only members in the membership areas, or membership materials owners. Copying and distribution of GSG content can be copyright infringement. All content on greensmoothiegirl.com is copyrighted. If in doubt, inquire to affiliate support. Upon registration, US affiliates are required to send a completed Form W-9. Non-US Affiliates are responsible for determining applicable tax procedures. Some non-US affiliates will find Form W-8BEN appropriate. Line 1 of Form W-9 must match the name on the tax payer's tax return. Please include the affiliate's name if not present on the W-9. Tax information and/or forms not provided within 30 days may result in delay or forfeiture of commissions. US Affiliates who are paid at least $600.00 by GSG during the calendar year, whether through the GSG Affiliate program or in combination with other means, will be sent IRS Form 1099-MISC as required by law. * By participating in our Affiliate Program, you agree to provide information necessary for the processing and delivery of this annual tax document. *Please be aware that PayPal may also send a 1099 which will include your GSG Affiliate earnings. Reporting earnings from both 1099s may result in over-reporting of income. Regardless of the amount of Affiliate earnings, Affiliates are responsible for reporting all Affiliate commissions as gross income. It is taxable income. Affiliates must demonstrate an ongoing effort to promote GSG products and services through an approved venue. GreenSmoothieGirl reserves the right to reject any earned commissions and to remove any affiliate from the program at our sole discretion. Affiliates can earn lifetime commissions from the referrals generated by their leads. To remain eligible for lifetime commissions, affiliates must promote to their leads at least once per year. Leads not promoted to within one year will no longer earn commissions for the referring affiliate. Accounts will be deleted if affiliate link clicks have not been generated for more than one year. Our affiliate program does not allow participation for the primary purpose of earning referral commission for personal purchases (self-referrals). Accounts using the program primarily for self-referrals may be closed without notice. 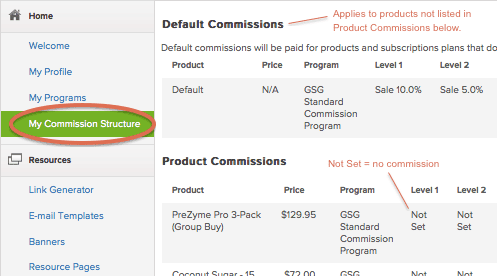 Affiliates generating only self-referrals are not eligible for commissions. Affiliates earning only Tier 2 commissions are not eligible for commissions. Eligibility requirements are the discretion of GSG. As a guideline, a minimum of 2 non-self-referrals per month, and historic sales of at least $300 during the past 6 months is expected. Exceptions may be granted affiliates demonstrating a regular, ongoing effort to promote GSG products or services. Reciprocation of referrals between affiliates to earn commissions is not allowed and may result in closure of both affiliate accounts. Affiliates may have relationships with other affiliate programs; however, a venue used primarily as a platform to distribute affiliate or marketing content for GSG and/or other affiliates or brands is ineligible for commissions. Accounts will be considered inactive if affiliate link clicks have not been generated for more than four months. Accounts generating only self-referrals are considered inactive. Inactive account must request to be reactivated within one year of inactivity, or the account will be deleted. Returns will not be accepted for orders placed by affiliates if the reason for the return is that the affiliate did not receive an expected referral commission for the order. Affiliates are responsible for knowing tax laws applicable to their participation in our affiliate program. Affiliate accounts in violation of any terms may be deactivated without notice. Violators may be banned from the GSG website without notice. We reserve the right to accept or deny referrals at our discretion; to raise, lower, or discontinue commission rates at any time; and to decline or terminate affiliate accounts if we feel our products or services are not being publicized in an appropriate manner or if we have any other concern about the advertising or marketing techniques employed by the Affiliate. Affiliates have no obligation to continue and may terminate their membership at any time. When emailing affiliate support, please include a link to or copy of your promotional material associated with the order in question, along with the name, date or order number, and/or email address of the customer. Please direct Affiliate Program questions to affiliate support.